The best gyro I've had in the GB area and I think there is only one other place I've heard that could give it a run --- which I haven't tried. Prices are average and its just a little facility that isn't that visible. 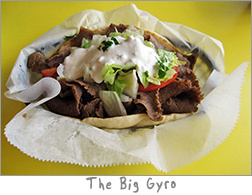 But its a great gyro in my opinion. I love to go back when I crave a gyro! This is the best gyro I've had in GB. They put a good amount of meat on it too. Nice. Splurge and get the greek fries, they're awesome. The gyros here are really good, maybe not the best I've ever had in my life, but certainly the best I've had in Green Bay. They also load on the meat on the large sized gyro. Their falafel on the other hand is another story. I would not recommend getting that, it didn't even taste like falafel and the ones I got went in the trash half eaten. Next time I would like to try their greek fries because they look pretty delicious. It's hard to believe that someone took an old subway and made the place better. The owners brightened up the place and made it cleaner, even the bathrooms are totally renovated. Good bakalava, good gyros, the greek fries (thick fries with feta, oregano and malt vinegar) are a meal within themselves and they offer greek beer. 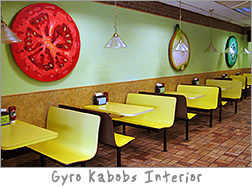 I was hungry for a Gyro so I went to the Greek Restaurant Gyro Kabobs which is located in historic De Pere on the Eastern border of Green Bay. The restaurant is bright and spotless with a neon color theme. The walls have a border of red brick and are painted below with a soothing mint green. Hung on the walls are these giant colorful pieces of vegetables such as a tomato slice, an onion slice and a cucumber slice, how fun. There are plenty of booths which are painted a bold yellow color with low hanging clear lamps over each one. Playing in the background was wonderful middle eastern. The menu is printed on bright lime green paper that is hung on the side of the wall by the cash register. You place your order and help yourself to your beverage and pay for everything right there. When your order is ready they bring it to your table. 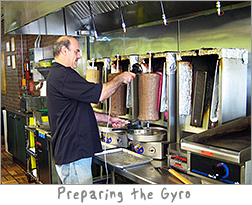 The Gyros are prepared the traditional way by slicing ribbons of roasted seasoned meat from four different vertical rotating doner grills. There is a long clear glass case with the makings for the sandwiches and located behind that are the grills. You can watch all the food being prepared while you wait at your table. I was famished today so I ordered a Gyro which is called The Big Gyro on a 7” pita which is the specialty of the house for $6.50 and French fries with a beverage for $2.60. The food came out fast and what a sandwich it was! It was Grande in size, it must have had at least a pound of meat on it wrapped in a warm pita with fresh cilantro, lime juice, onions, tomatoes, and lettuce served with tzatziki sauce. The whole thing together tasted awesome, the sauce was fresh and added on top of the Gyro was a treat. My French fries were also fresh, lightly browned but not greasy. They do offer smaller Gyros if you are watching the calories. I did notice by the register they also offer Baklava for dessert and they also carry beer and wine. Gyro Kabobs certainly satisfied my craving for a delicious Greek Gyro.